Fourth Round: Beat Brighton 3-2. Third Round: Beat Bristol City 2-0. Fourth Round: Beat Derby County 3-0.
was unfathomable that things could go so wrong after. 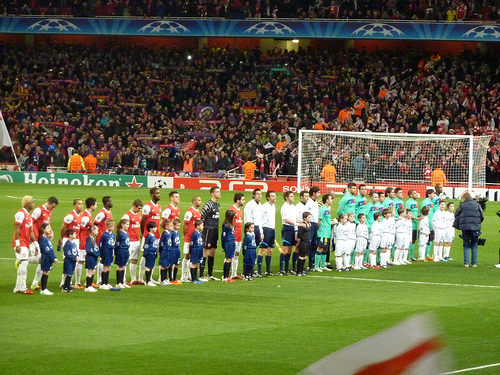 On February 16, 2011, Arsenal hosted Barcelona at the Emirates. It was a famous European night, as Arsenal came from behind to beat La Liga's giants, 2-1. At that moment in time, Arsenal were still in all four competitions, with a cup final to play at the end of the month. And then, it all unraveled. Arsenal lost to Birmingham in the League Cup Final. They lost the second leg of the tie with Barcelona. They lost in the FA Cup at Old Trafford. By April, their season was in a tailspin, and they fell from second place to fourth. The following season, as you know, was characterized by long stretches on both sides of the spectrum: long winless streaks, long winning streaks, and everything in between. This team has changed drastically in just two calendar years, but one fact remains: they still have not won a trophy since 2005. Two years ago, this team looked assured that they would win something to finally end the drought. Then, it all came crashing down. The pieces are only now starting to fit back together in certain spots. As you know, the FA Cup remains Arsenal's best shot this season at winning silverware. The importance of this game is tremendous. There's a bit of good news in the injury report this week, as it appears Thomas Vermaelen could be available for selection again. The captain has not played since the 2-2 draw with Liverpool, meaning he has missed two matches. Kieran Gibbs is now the only long-term injury on the list, as he is out with a thigh problem. Lukasz Fabianski played midweek for the reserves, in a 2-2 draw with Manchester United. As for the doubts, Jack Wilshere (thigh) and Laurent Koscielny (calf) both face late fitness tests, but you have to think both should be rested anyway, with Bayern Munich coming to town on Tuesday night. Arsenal should still have enough quality to beat a mid-table Championship side, but then again, most of their starting XI couldn't beat Bradford City, so who knows? Carl Jenkinson serves a one match ban for his red card last week. the Coventry game in September. Paul Robinson has conceded 53 goals against Arsenal in his career, more than any other goalkeeper against any other opponent. Unfortunately for the Gunners, he won't be playing this one. There was some talk about Robinson leaving Rovers at the deadline, but nothing went through for the 33 year old, who has not played since December 7 with a back injury. David Dunn is a doubt with a calf injury; he has not played since January 26 in the FA Cup against Derby County, though he was close to a return midweek against Brighton. Josh King, signed from Manchester United recently, is also a doubt with a hamstring problem; he also has not played since the Derby cup tie. Leon Best has not played at all this season with a long-term knee injury. Dickson Etuhu is also out with a knee injury; he has not played since December. Adam Henley remains out with a hamstring problem. Seagulls equalized from the penalty spot. The match ended 1-1. So, let's talk a bit about Blackburn Rovers, as you've probably lost track of them in the Championship by now. Somehow, Steve Kean remained in charge of the squad despite the fans' clamoring for him to be sacked all of last season. Rovers started life in the Championship well, going unbeaten through their first six matches, leaving them at the top of the table. They suffered their first loss on September 21, to Middlesbrough. On September 28, Kean resigned, citing that his position with the club was untenable. Since Berg's sacking, Blackburn have lost just once in their last eight Championship matches, while winning their two FA Cup ties in the process to progress this far. On January 11, Rovers hired Michael Appleton as their manager (Appleton had just served a 65-day stint as manager of Blackpool before switching.) Appleton's first match in charge, a 2-1 loss to Charlton stands as Blackburn's only loss since Berg was sacked. Blackburn played this midweek, drawing 1-1 at Brighton & Hove Albion on Tuesday night. Currently in 8th place, Blackburn are six points back of the final Championship play-off spot. Arsenal and Blackburn have not met this season, after Rovers were relegated from the Premier League last year. The two meetings last season were wildly different affairs, with both sides winning once. At Ewood Park in September, as part of their early season struggles, Arsenal scored twice on their own net in what amounted to a 4-3 loss. At the Emirates in early February, Blackburn were reduced to ten men during the course of the first half, and Arsenal went on to pound the Rovers, 7-1. I won't tell you who had a hat trick for Arsenal that day; you can figure that out for yourself. Alex Oxlade-Chamberlain had a brace, Mikel Arteta had one, and Thierry Henry had the last one, which was later called a Blackburn own goal by the Dubious Goals Committee. All-time in this competition, Arsenal and Blackburn have met in seven ties; Arsenal have won four of them, Blackburn have won three. The last meeting, in 2007's fifth round saw a 0-0 draw at the Emirates. Blackburn went on to win the replay at home, 1-0, with Benni McCarthy scoring the winner in the 87th minute. That loss came days after Arsenal lost the League Cup Final to Chelsea at Wembley. That cup tie was the only one of the seven that was not won by the team drawn at home (aside from neutral venue matches, of course.) Arsenal won the first two FA Cup ties with Blackburn, 2-0 and 3-1 in 1901 and 1926, respectively. Blackburn won the next two ties, 1-0 and 3-0 in 1928 and 1966, respectively. Arsenal then won back-to-back ties by 3-0 scorelines, in 2001 and 2005, the latter of which was the semifinal before Arsenal's last FA Cup win. Okay, now that that's out of the way, let's talk about Dean. Arsenal's form with Dean is now D-D-L-D-L-D-L-L-W-L-L-D-L-W-L-D-D-L-D*-L. The D* represents losing to Bradford City on penalties (which counts as a draw when discussing form.) Two wins from 20, with 10 losses and eight draws. If you want some glimmer of hope, one of the two wins came in the FA Cup against a Championship side, Leeds United, in a replay at Elland Road in January of 2011. The other win was over Tottenham, so that's nice, right? And, the last time Arsenal saw Mike Dean, it's not really Dean's fault that Laurent Koscielny briefly turned into a rugby player, is it? Dean has taken charge of four Championship matches this season, but none have involved Blackburn Rovers. Last year with Dean, Blackburn had a record of two wins and one loss. One of the wins came at Old Trafford, the other was over QPR. The loss was to Chelsea. Of the four red cards Dean has shown this year, two of them have been to Arsenal players. Note that Chelsea's Europa League fixture prevented them from being able to play their fourth round replay with Brentford until this weekend. The fifth round tie between the winner of that replay and Middlesbrough will be played Wednesday night. As of this moment, there are 17 teams remaining (as there's still one replay to be completed.) Of those 17, seven are from the Premier League, six are from the Championship, three are from League One, none are from League Two, and one (Luton Town) is from Conference National.